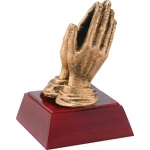 Commemorate special spiritual occasions with our religous-themed trophies. 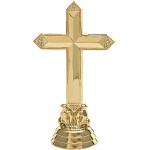 Engrave names, dates or phrases to mark significant occasions such weddings, baptisms, first communions, confirmations, memorials and other religious events. These trophies also make wonderful awards for bible camp events and competitions. A free, personalized foil tape is included with each trophy, or you may choose an engraved brass plate for an additional cost.